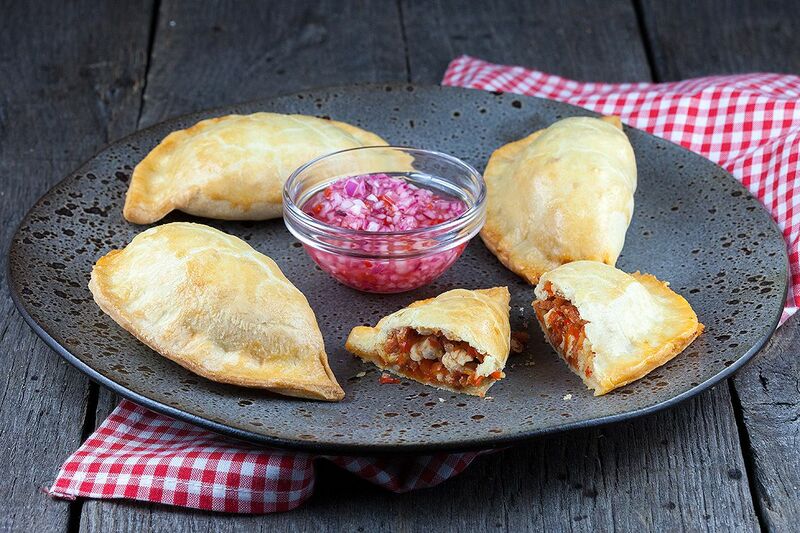 Chicken and chorizo empanadas with home-made dough and an A-MA-ZING red onion salsa. And psst, there's even cheese inside! Start with the dough for the empanadas. COMBINE flour and salt, you can use an electric mixer or knead the dough by hand. CUT the butter into cubes and add them one by one to the flour until the dough looked crumbled. ADD 1 egg and gradually pour in the water until it forms a dough ball. WRAP the dough ball with cling film and refrigerate for half an hour. Meanwhile prepare the filling and red onion salsa. PEEL and finely chop the red onions and place them in a medium-sized bowl. PEEL and finely chop the garlic cloves. ADD half of the chopped garlic with the red onions and set the other half aside. REMOVE the seeds of the red pepper and chop it into fine cubes. 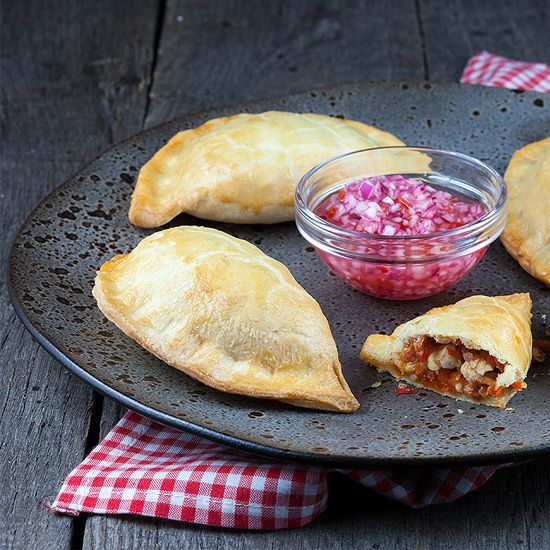 CHOP up the chorizo into small pieces, if they’re too large the empanadas won’t close well. 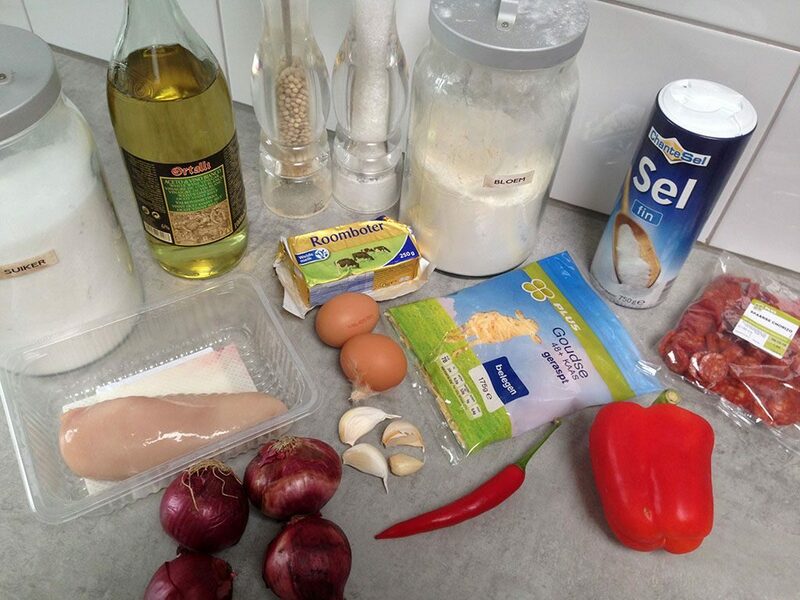 REMOVE any excess fat or muscle from the chicken fillets and also chop them up into small pieces. ADD the white wine vinegar along with 1 tablespoon sugar to a small saucepan and heat it up until the sugar has dissolved completely. Let it cool of slightly and meanwhile REMOVE the seeds from the red chili pepper and chop it up as fine as you can. MIX the chopped red onion, garlic, red chili pepper and white wine vinegar. HEAT olive oil in a large skillet and saute the rest of the chopped garlic for a minute, then ADD the chicken pieces and saute another minute. ADD red pepper and chorizo pieces and cook until the chicken is fully cooked. SEASON with pepper and salt and let the filling cool off completely. DUST your work surface and rolling-pin with flour. KNEAD the dough shortly and then roll out the dough. CUT the dough into circles with a diameter of about 10 cm (3,9 inch), you can use a cookie cutter to do this. We used an empanadas maker, but you can also simply place some of the filling on one side of the circle, add some grated cheese on top and close it using a bit of water and a fork. Neatly FOLD the edges inwards if you like and place them on a baking tray lined with parchment paper. REPEAT until all the filling and dough is being used and meanwhile PRE-HEAT the oven to 190 degrees celsius or 375 degrees fahrenheit. 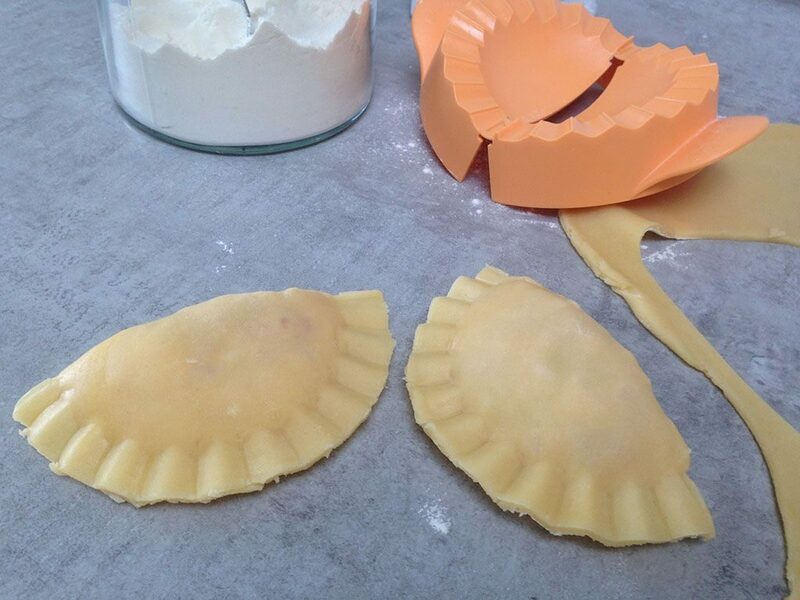 BEAT the second egg and use a silicone kitchen brush to coat the top of the empanadas. 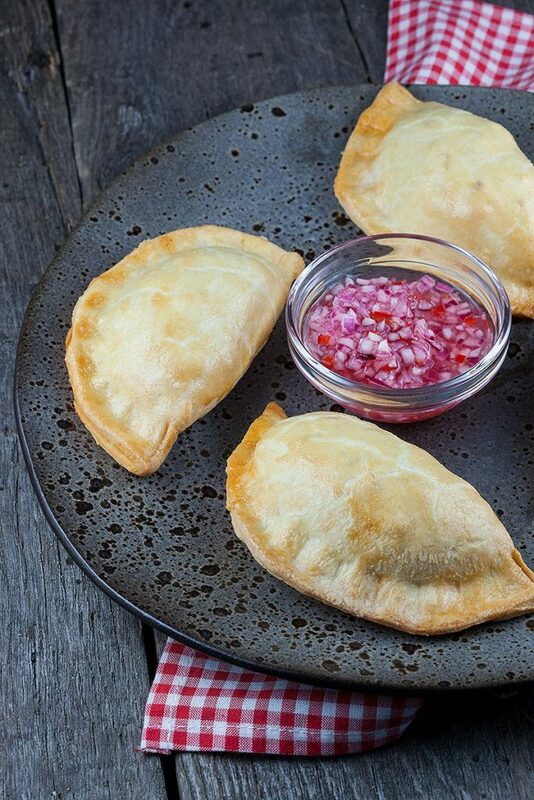 BAKE the empanadas in the oven for about 20 minutes, depending on their size and your oven. SERVE them hot with the red onion salsa and enjoy! At the first sight, I though it is a durian. But when saw at cut pieces, it was so amazing for me. It is really the great cooking idea. I’m making a plan to try this recipe. Thanks.